"Repressed. A spectacular archival package of primitive drone and minimalist rock/trance from the Swedish underground, believe the hype as follows; this is going to be one of the most memorable CD audio documents of the year 2001... " - FE. 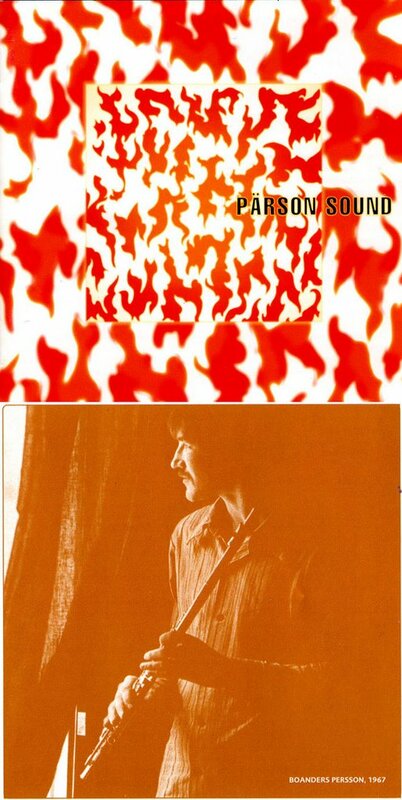 "After years of research were proud to present the nucleus of the Swedish 1960s-70s underground psych rock scene: the legendary Pärson Sound. This 2-CD set presents the most remarkable Swedish underground band, known in a later incarnation and continuation as International Harvester and Träd, Gräs och Stenar (Trees, Grass and Stones), and features both intricate studio recordings and orgiastic live performances. Pärson Sound never released any records in their time and that is why a very few have heard about them at all. The recordings date from 1967/68 while the band explored unknown musical territory as well as inner- and outer space. In 1968 they were invited by Andy Warhol to play at the opening of his exhibition: Screens, Films, Boxes, Clouds and a Book, at the museum of Modern Art in Stockholm and also opened for the Doors. Influenced by the musical concepts of Terry Riley, Pärson Sound worked at discovering and perfecting their own unique approach towards the mixing of rock and minimalism. They created some of the most remarkable psych- trance-drone-pre-noise music-rock sounds ever recorded. Pärson Sounds music described contexts, interplay and organic growth and shaped a conception of the world -- an opposite of fragmentation, individual achievements and intellectual construction. This world was to be perceived as one body, a whole of inviolable parts. The minimalist repetition with slight changes gives associations of a slow growth, of cyclic process, of breathing, pulse, life, movement and machines. The persistent repetition gives the listener an opportunity to discover the sounds, to meditate, to go into the music, join the same journey. Many times one can discover a relationship with music of other cultures. In comparison the music of the Western world can feel cursory, unreliable -- as a fear of entering deep into feeling. Pärson Sounds compositions often consist of harsh structures -- a rhythm pattern with ostinato bass, a melodic figure -- which forms a base for improvisation. Other songs have a more thoroughly elaborated structure that still leaves room for variation. The moment, the audience, the location formed their music. Their key phrase was We, Here and Now! With time, the music came to have an increasing religious or shamanistic streak -- with a raised demand of intensity, presence and warmth -- a striving for euphoria and ecstasy. The bands psychedelic approach towards music is so fresh and vital that it transcends time. Listen to it now! A 2xCD with an informative booklet in English and lots of photos." - Subliminal Sounds. 2016 repress. "Deluxe triple LP box set. A spectacular archival package of primitive drone and minimalist rock/trance/psych from the Swedish underground -- believe the hype as follows; one of the most memorable audio documents ever. After years of research, Subliminal Sounds is proud to present the nucleus of the Swedish 1960s-70s underground psych rock scene: the legendary Parson Sound. This deluxe 3LP box set presents the most remarkable Swedish underground band, known in a later incarnation and continuation as International Harvester and Trad, Gras och Stenar (trans. "Trees, Grass and Stones"), and features both intricate studio recordings and orgiastic live performances. Parson Sound never released any records in their time and that is why very few have heard about them at all. The recordings date from 1967-1968 while the band explored unknown musical territory as well as inner- and outer space. In 1968, they were invited by Andy Warhol to play at the opening of his exhibition: "Screens, Films, Boxes, Clouds and a Book" at the Museum of Modern Art in Stockholm and they also opened for The Doors. Influenced by the musical concepts of Terry Riley, Parson Sound worked at discovering and perfecting their own unique approach towards the mixing of rock and minimalism, creating some of the most remarkable psych- trance-drone-pre-noise music-rock sounds ever recorded. Parson Sounds music described contexts, interplay and organic growth and shaped a conception of the world in opposition to fragmentation, individual achievements and intellectual construction. This world was to be perceived as one body, a whole of inviolable parts. Their minimalist repetition with slight changes renders associations with slow growth, cyclic process, breathing, pulse, life, movement and machines. This persistent repetition also gives the listener an opportunity to discover the sounds, to meditate, to go into the music and join the same journey. Many times, one can discover a relationship with music of other cultures, and in comparison, the music of the Western world can feel cursory, unreliable -- as a fear of entering deep into feeling. Parson Sounds compositions often consist of harsh structures -- rhythm patterns with ostinato bass, a melodic figure which forms a base for improvisation. Other songs have a more thoroughly-elaborated structure that still leaves room for variation. The moment, the audience, the location formed their music. Their key phrase was "We, Here and Now!" and with time, the music came to have an increasingly religious or shamanistic streak, with more intensity, presence and warmth, striving for euphoria and ecstasy. The bands psychedelic approach is so fresh and vital that it transcends time. Listen to it now! A 3LP with informative, revised liner notes in English and lots of photos." -Subliminal Sounds.